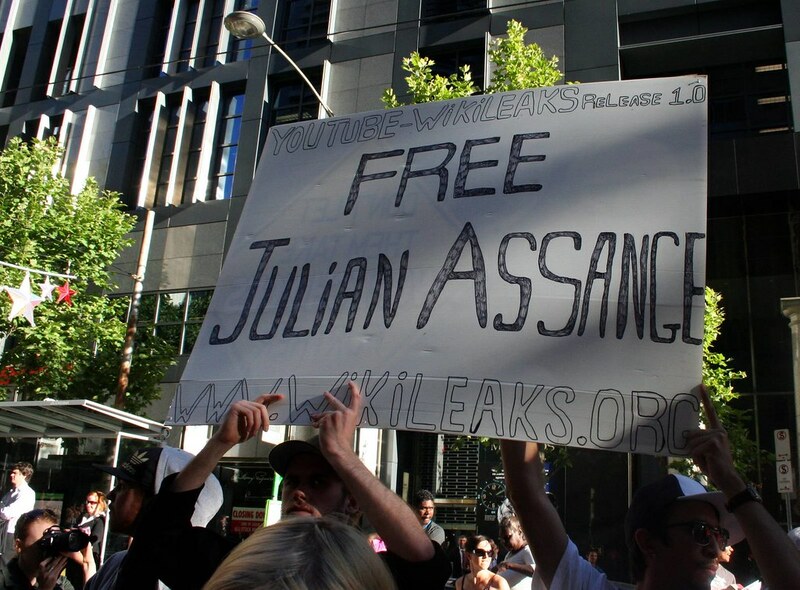 Home » The public is on the defense of Assange. What is the reason? The detention of WikiLeaks founder Julian Assange in London remains in the top of the global information trends. And it is not surprising: the seven-year voluntary imprisonment of the whistleblower at the Ecuadorian embassy ended in being handed over to the British authorities. However, two days after this high-profile event, there comes a sobering-up and Assange is not only spoken of as a criminal. The news of the arrest of Assange that has spread all over the world has stirred up the international community and has not left him alone for the second day. Thematic information flow can only be compared with the presidential elections in 2016 or the flight in 2013 from the States of the former employee of the National Security Agency (NSA) Edward Snowden. That is, this event is a global scale, and nothing else. The most interesting thing is that during the years that Assange spent in voluntary custody at the Ecuadorian embassy, ​​he, Assange, was almost forgotten. The Western public labeled him as a criminal who received secret information through dishonest means and made it public. And many had doubts about the accuracy of the information published by WikiLeaks. However, the presidential campaign in the US in 2016, the election victory of Donald Trump, and then the notorious investigation of the “Russian case” once again partially revived interest in the Assange figure. One of the points of accusation by Special Prosecutor Robert Muller is an agreement between Trump and his team with WikiLeaks, through which the irregularities in the Democrats headquarters, Hillary Clinton's headquarters were exposed. One of the employees of Trump's headquarters, one Roger Stone, in the campaign period of 2016 inadvertently boasted about his “communication channels” with the founder of WikiLeaks. Muller suspected that Stone was behind the publication of thousands of emails from members of the Democratic Party almost immediately before the presidential election. And what is connected with this Assange. It would seem that the puzzle was formed, and the ring around Stone, Assange and Trump closed. But Robert Muller failed to prove this connection. And this extremely important conclusion formed the basis for Assange’s real apology, which is now being spoken about by something completely different, calling him a fighter for freedom of speech, an innocently injured journalist who would rot in prison for what others received the Pulitzer Prize. The first and most important question that is being asked by the media and representatives of the establishment is whether Assange is a journalist? As you know, they want to judge the Australian under American law, and the US law has a clear concept of the First Amendment to the Constitution - guarantees of freedom of speech. If we consider Assange as a journalist, then he is under the protection of this amendment. And if as a spy or a hacker - not at all. The essence of the charges against the Australian comes down not to the fact that he illegally published any information, but to the fact that he assisted the former soldier Bradley Manning in hacking into military computer systems. So means, Assange will be judged as a spy? Again no. The fact of the matter is that he has not yet been charged with espionage. This confusion on the threshold of any clear indictment and opens up a wide field for discussion. “When you read the indictment, it does not look like Assange is a journalist,” said Bruce Brown, executive director of the American Committee of Journalists for Fight for Freedom of Speech. Assange's lawyer Barry Pollack believes that Assange should be treated exactly like a journalist, despite the fact that his status is not obvious so far. The lawyer is confident that the Australian has received and distributed information that is in the public interest, and this is journalism. However, the prosecution very cunningly builds its conclusion: Assange is accused not of disseminating secret information, but of her theft and concealment of Bradley Manning. Next - the points. It is noted that the indictment Assange presented such provisions, which can easily be blamed for any journalist. "Part of the conspiracy" is what Assange took action to hide from the investigation of Bradley Manning as an informant for WikiLeaks. “Most, if not all investigative journalists take such measures to protect their sources. The indictment also states: "This was part of a conspiracy when Assange called on Manning to provide information and records from US departments and agencies." Another charge - Assange and Manning used a shared folder in the cloud storage WikiLeaks to transfer sensitive information. In a word, despite the fact that the focus is on the theft of secrets, the investigation failed to escape from Assange's accusations of the guilty majority of journalists. The new role of Assange is not only a journalist who will be tried for being a journalist. There are opinions that the figure of Assange is now becoming a symbol of double standards resorted to by the Western media. And indeed, let us remember how he was amicably blackened by all and sundry. The reason - the investigation of Muller against Trump. And the de facto Australian whistleblower became a link in the chain of accusations against the head of the White House. But the situation is heterogeneous. Part of the public previously whitewashed Assange, and now attacks him, and part - was his open enemies, and now they are talking about freedom of speech. At this stage it is important to state the main thing: the figure of Assange gradually acquires a symbolic character. Assange is no longer just a detained Australian, the founder of WikiLeaks, but for some it is the culprit of some thefts of secret information, and for others it is a symbol of the struggle for freedom of speech. And in the Western world, a rethinking of this image is already taking shape, a sobering up. However, will this save Assange from extradition to the US and a life-long prison sentence? Hardly.